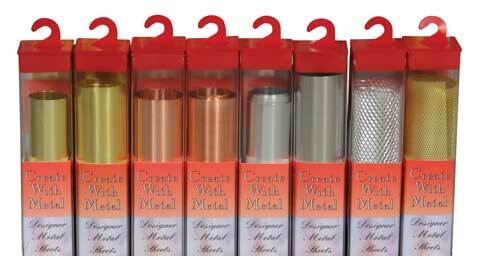 Ideal for use in arts, crafts, sculpting, fashion and design projects, these lightweight metals are extremely easy to cut, stamp and crimp to create stunning designs. The metal foils are available in 12" x 30" rolls of brass, copper, aluminum and stainless steel in a variety of thicknesses. The metal mesh is available in a 12" x 24" roll of aluminum and a 12" x 12" roll of brass.